Commercial truck drivers training requirements (or lack there of) has long been an issue of dispute and despite the Transportation Department being orderedtwice by Congress to do something about it, the agency has failed to do anything at all. So last week, the Teamsters and several safety advocate groups took matters into their own hands and sued the Federal Motor Carrier Safety Administration in federal court. He’s referring to the statistics from the last few years, which indicate that while overall automobile fatalities in the United States have dropped, the number of deaths involving large trucks have increased by 4 percent since and an 18 percent increase in injuries since 2012. Perhaps more alarming if you look at what these figure actually amount to: 4,000 deaths and roughly 70,000 injuries. Jasny further explain that without FMSCA training regulations, new drivers only need 10 hours of classroom training and a very simple process to obtain a commercial driver’s license. “They pass a written test, drive a truck around the parking lot for 10 minutes to get their C.D.L. and they’re basically able to go out,” he said. While many trucking companies have their own more extensive training requirements that extend over several weeks and involve a combination of classes and driving with a senior instructor, it’s the federal requirements that the safety advocates are concerned with. “It’s the fly-by-night schools, the diploma mills that we’re really worried about. Independent drivers, where they take a quick training course and suddenly they’re driving next to you in an 80,000-pound truck,” Jasny explains. The Federal Motor Carrier Safety Administration has issued a public statement in response to the suit saying that safety is their top priority and that they’ve been collaborating with other agencies to design and implement entry-level driver training that includes behind-the-wheel instruction for operating large trucks and buses. 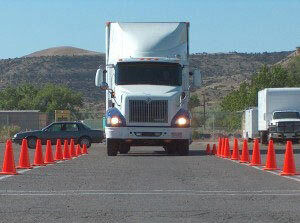 What are your thoughts on improving commercial driver training?